The featured speaker at the February 14th NOAH meeting was Tim Spuckler, editor of Notes from NOAH. Tim spoke on a trip he took to Florida and his experiences in maintaining and breeding corn snakes. Tim began his talk by reminiscing about a camping trip he took to Florida in the late 1980s. While camping near Daytona, Tim saw not only a great abundance of wildlife, but also a great diversity which ranged from insects and birds to amphibians and reptiles. And much of the wildlife was right in or near his campsite. One goal of his Florida trip was to test out a device that his friend had made which would be useful in catching venomous snakes. It worked very well - they caught quite a few cottonmouths, which were common in the area. Another goal that Tim had was to catch a herp that he had never caught before. This proved elusive for a while; investigation of excellent herp habitats turned up nothing. Or at least no herps. They did come up with some whiptail scorpions, black widow spiders and an unusual blue crab that they found by noting the rustling sound it made while it maneuvered across the leaves in the woods. As they were leaving the campground one day to herp in a different area, they came across a gopher tortoise on the side of the road. As they finished photographing it they heard an unusual sound some distance away that resembled the sounds produced when a snake constricts a rat. Walking down the road to investigate, that's exactly what it was! A corn snake was constricting a rat. This was the first corn snake that Tim had ever seen in the wild. So now his second goal had been achieved - adding to his life list of herps. My first corn snake found in the wild. Caught near Daytona Beach, Florida in July of 1989. 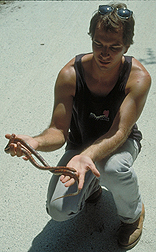 The snake was released after being photographed. The remainder of Tim's talk was devoted to the care and breeding of corn snakes. After describing the physical appearance of typical corn snakes and their mild temperament, Tim pointed out the tremendous variation in color and how particular color morphs were found in particular regions. Near Fort Myers, Florida, for example, corn snakes have very little orange or red, while in northeast Florida they have a great deal of red, and so are called blood corns. Perhaps the most beautiful variation is the Okeetee corn snake from southeastern South Carolina, where corn snakes have a bright orange ground color with bright red blotches. Okeetees also tend to be larger than the four-foot average seen in most corns. The Miami phase corns, on the other hand, have a grey background and tend to be smaller. Just to the west of the corn snake's range in the U.S. is the Great Plains rat snake, a subspecies of the corn snake group. The Great Plains rat snake looks very much like a corn snake, but it is smaller in size and much less colorful. A naturally occuring intergrade between a corn snake and a great plains rat snake. In Ohio we have a relative of the corn snake - the black rat snake. At first the black rat snake does not seem to resemble the corn snake. But in amelanistic specimens, which lack the black pigment, a pattern is revealed which looks very much like a corn snake's. We also have fox snakes in Ohio, which also resemble corn snakes somewhat. Relatives of the corn snake are found throughout the eastern U.S. as well as in China, Mexico, Europe and Asia. So this group of snakes is a very successful group. The black rat snake and eastern fox snake are two corn snake relatives that live here in Ohio. Corn snakes are one of the most popular reptile pets for a number of reasons: They are easy to care for and maintain; they don't grow very large; they are tolerant of a wide range of temperatures and do not have to be maintained at high temperatures like many other reptiles; they don't need to have their diet supplemented like many lizards and turtles, which eliminates the problem of under- or oversupplementation which is a common veterinary problem; they don't need any variety in their diet, eating the same thing their whole life; they have a long lifespan - the oldest corn snake on record is over 32 years old; and they do not require any sunlight or artificial full-spectrum light, as do many lizards and turtles. Even with all these advantages, however, potential purchasers should read up on these snakes, or consult with NOAH members or the NOAH web page, to make sure a corn snake is what they really want and that they are able to provide the proper conditions for it. One of the first things to consider when obtaining a corn snake is the enclosure. Corn snakes are escape artists, so the cage must be escape-proof. Snakes also prefer small spaces rather than wide-open spaces. Tim's rule-of-thumb is that the cage length should be about 2/3 the length of the snake and the cage width should be about 1/2 the length of the snake. Snakes are also solitary animals, so should be caged individually. Tim recommends Neodesha cages, which fulfill all of these requirements. They are also very sturdy and he has had some of his cages for over 17 years. He has also uses small plastic cages with snap-on lids, for some smaller snakes. 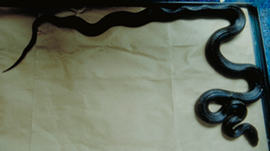 Shoeboxes with the attached lids and snap-on clips are also good for small snakes. Ventilation holes can be added to these plastic cages by heating a nail until it's red-hot and then pushing it through the plastic. For really tiny corn snakes, such as newly hatched snakes, Tim recommends a very small Tupperware container. and commercially made Neodesha cages. Tim has also converted other items to snake cages, such as an old dresser that a neighbor was throwing away. The dresser required some modification, but it was much less expensive to do this than to buy new cages. A snake's cage should have three components. First, it should have a hide area; Tim uses the plastic dish left over from frozen dinners. If a snake does not have a place to hide, it can become stressed and will refuse to eat and may become ill. Second, a water dish is necessary. Third, a substrate is needed on the bottom of the cage. Tim prefers to use pine shavings or newspaper. Tim recommends feeding snakes in moderation, rather than overfeeding them. Baby snakes should be fed small "pinky" (newborn) mice, about every four days. But each snake is an individual and some may need to be fed more often than others. Keeping good feeding records is very useful in this regard. 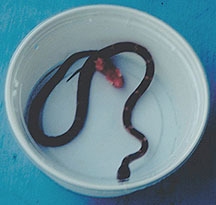 Baby snakes often feed more readily when placed in a small container such as an 8-ounce deli cup. This feeding method is referred to as "cup feeding. "As snakes grow, they should be fed larger food items. Tim suggests that the rodent being fed to the snake, whether to baby snakes or adults, have a width about the same size as the width of the widest part of the snake's body. Also, most snakes will feed on dead rodents and Tim recommends purchasing frozen rodents in bulk from a breeder or at a NOAH Amphibian and Reptile Showcase; this is much cheaper and more convenient than going to the store every few days to purchase live rodents. If you do feed a snake a live rodent, as Tim sometimes does to give the snake some exercise, it is important to be present during the feeding period since a live mouse or rat can seriously injure or kill a snake if the snake is not hungry and does not kill the rodent. Also, a rodent can injure the snake while it is struggling during constriction. Cup feeding a baby corn snake a pinky mouse. Snakes shed at varying frequencies depending on their age. During their first year, corn snakes may shed ten times. As adults, they may only shed four times a year. Corn snake colors often get brighter as the snake grows and watching a corn snake shed its skin can be impressive as the new, brighter colors emerge. This is not true for all snakes; milk snakes, for example, may get duller or darker each time they shed. To assist snakes in shedding, it is important to have a fairly high humidity, otherwise the old skin will not come off easily. Tim sometimes helps the snake shed by putting it in a container with wet paper towels. Here in Ohio, houses often get too cold in the winter for captive snakes, so supplementary heating is important. A red bulb can add heat or a heating pad can be put under the cage, on one end so there is a cool area and a warm area of the cage floor. Snakes should always have a temperature gradient in their cage so they can choose the temperature they prefer. Tim kept snakes for about ten years before he decided to try breeding them. Now he finds captive breeding to be among the most rewarding aspects of the hobby. It may be difficult to determine whether your snakes are males or females. If that is the case, you can bring them to a NOAH meeting or a NOAH Showcase and experienced snake breeders will be able to assist you. Snakes reach breeding condition based more on size than age. Some corn snakes can reach 36" in a year and so are ready to breed, but most require 2-3 years to reach that size. This may depend on the feeding habits of the particular snake. Snakes must be in excellent health before attempting to breed them. They should be free of disease or parasites. 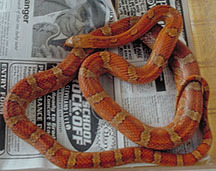 Successful breeding in corn snakes depends on a cooling-down period of several weeks where the snakes are kept at 50-59F. Tim stops feeding his snakes the first week in November, then leaves them alone for the next two weeks. Then he cools them down until around Valentines Day. At that time, he starts warming them up again. He feeds them small meals about a week later, though some snakes won't eat for a while. Once they start feeding, he offers them food more frequently than normal, about twice as frequently. The snakes need this extra nutrition in order to successfully breed and produce young. About 4-6 weeks after coming out of the cooling period, both the male and female snake will shed their skin. This indicates that they are ready to breed, although some corn snakes will breed before the shed and some will breed a couple of weeks after the shed. After shedding, the male and female snake are put together and left together for 3-4 weeks; they are kept on the accelerated feeding program during this time. When the female starts developing eggs, she will often stop feeding. Around this time, the hind end of the female's body appears swollen, as the eggs grow. Her spine also appears to stand out more along the back. At this point the male is removed from the cage. 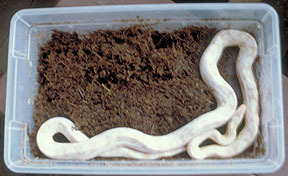 A gravid female snow corn in an egglaying nest box. Many snakes will shed their skin a predictable period of time before they lay their eggs. Tim's corn snakes generally do so ten days prior to egg laying. He prepares a nesting area by half-filling a plastic shoebox with saturated and rung-out sphagnum moss. Rather than cut a hole in the lid, which makes the shoebox useless for anything else, he just leaves the lid offset so the snake can crawl in and out. 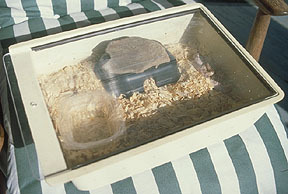 A corn snake enclosure with an egglaying nest box placed inside. Just before egg laying the female becomes very restless and cruises the cage. 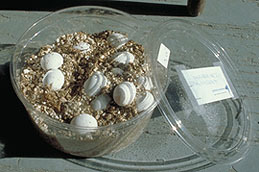 After the eggs are laid, they are removed and half-buried in a bucket partially filled with damp (but not wet) vermiculite. A lid is placed on the container, which is then placed in a warm place in the house and left alone. The ideal incubation temperature is about 82F. Every week the lid of container is removed to allow an exchange of air, and the vermiculite is checked for moisture content. If it is a little dry, some water is poured down the sides of the container, and this water is eventually taken up into the vermiculite. Some people use chicken incubators to incubate the eggs. Tim warns that such incubators should be kept in a cool area of the house or an unexpected heat wave might cause the eggs to overheat, producing deformed babies. A clutch of corn snake eggs being incubated in damp vermiculite. The clutch size varies with the size of the snake as well as with the variety. 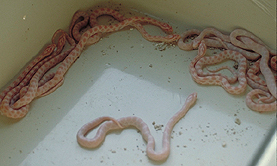 Some corn snakes typically lay smaller clutches while other types lay larger clutches. In a large clutch, each egg is smaller and rounder than the normal elongated corn snake egg. An average clutch is about 16 eggs. The downside of a large clutch is that the babies come out very small, and they may be difficult to get to feed. At a temperature of about 82F, the incubation period is 60-65 days. At hatching time, the baby snake will cut its way through the shell (called "pipping") but may not emerge completely for a day or two, often just sticking its head out occasionally. A group of freshly hatched baby corn snakes. After emerging, the baby snakes go immediately into a shed cycle, shedding their skin about 5-7 days later. They are set up in individual cages and fed after their first shed.